It’s both revered and demonized. The Nürburgring elicits strong reactions like no other racetrack in the world. Opened on June 18, 1927, the track will turn ninety in just a few weeks. The thirty-three percent incline has just been installed at the Karussell corner. The German Grand Prix is under the spell of the upcoming Olympic Games in Berlin. Olympic athletes—including the Indian hockey team and equestrians from Romania—as well as thirty thousand tourists arrive in the Eifel region by means of a car rally and twenty-three special trains. The race offers 220,000 spectators the chance to watch a duel between Mercedes and Auto Union, with Auto Union ultimately emerging victorious. Bernd Rosemeyer wins ahead of his teammate Hans Stuck. The win also means another major success for Ferdinand Porsche, who designed this car, the third (hence the designation “Type C”) in the Grand Prix history of the brand. The sixteen-cylinder engine puts out 387.8 kW (520 hp), with a maximum speed of 320 km/h. Over the course of its history, the wonder car breaks over thirty world racing records. The 1956 World Sportscar Championship is a showcase of some of the greatest drivers in history. Juan Manuel Fangio and Sir Stirling Moss are among the illustrious field itching to tackle the one thousand kilometers of the Nordschleife. More than seventy thousand fans come to watch the race and admire the numerous Porsche models. Twenty-two private teams enter six Porsche 550 A Spyders, sixteen Porsche 356s, and 356 Carreras in the race. And then there is the factory team, which fields two 550 Spyders, with Wolfgang Graf Berghe von Trips and Umberto Maglioli in one and Richard von Frankenberg and Hans Herrmann in the other. Trips and Maglioli manage fourth in the overall classification and score Porsche’s first class victory in the category for cars with up to 1,500 cc of displacement. The other 550 takes second. Overall victory goes to the Maserati drivers—Taruffi / Schell / Behra / Moss. While Formula One is going through a rough patch in Germany six years after the death of Graf Berghe von Trips and twelve years after the withdrawal of Mercedes-Benz, a great age of sports-car races is beginning—with Porsche leading the way. TV cameras are on hand to broadcast the one-thousand-kilometer race to the world, as well as its historic result: for the first time, a race car from Zuffenhausen takes overall victory. During the race, the Nürburgring provides the requisite drama: holding a sizable lead, Lucien Bianchi and Gerhard Mitter are forced to abandon the race on the final lap with a broken alternator. Nevertheless, Porsche sweeps the top four places. Leading the charge: Udo Schütz / Joe Buzzetta. How quickly the drama of motor racing can turn to tragedy is seen during the 1969 season two years later: Bianchi dies at Le Mans in the spring and Mitter on the Nürburgring in August. A one-thousand-kilometer race is an ever-reliable source of fascinating moments, as Richard Attwood’s “flying” Porsche 908/02 in 1969 so impressively demonstrates (page 76). One year later, as the FIFA World Cup is getting under way in Mexico, Germany has already claimed the World Sportscar Championship title. Or is it Austria? One thing is clear: Porsche is the victor. Before a hundred thousand fans, Kurt Ahrens and Vic Elford take victory in the one-thousand-kilometer race in their Porsche 908/03, edging out team colleagues Hans Herrmann and Richard Attwood for the win. Both cars are entered by Porsche Salzburg. As they are both factory cars, they wrap up the manufacturers’ title well ahead of time. Two weeks later, Attwood and Herrmann win the twenty-four-hour classic at Le Mans. 47,376,000 minutes—that’s roughly how long ninety years last. 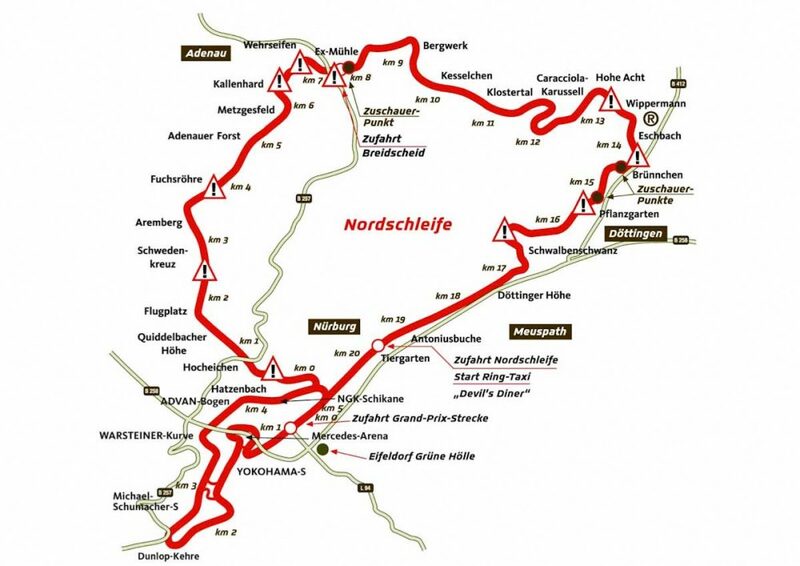 If one were to reduce the nine-tenths of a century that the Nürburgring has been in existence down to a single race, it would last 6:11.13 minutes. That is precisely how long Stefan Bellof needs in training for the final one-thousand-kilometer race on the old Nürburgring on May 28, 1983. 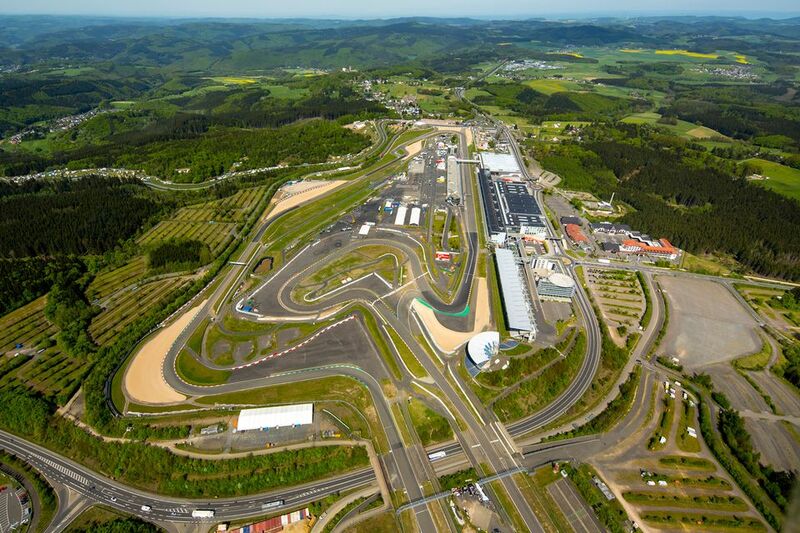 Due to construction on the new Ring, the lap circuit has been shortened—the drivers are starting from Döttinger Höhe. A lap is now 22.832 kilometers instead of 20.832 kilometers. Never before and never again does a driver lap the circuit at an average speed of over 200 km/h. No other driver dares to drive in such a rigidly tuned car with such a razor-thin margin of error at the limit. Too thin even for the wunderkind at times: the next day, his 485-kW Porsche 956 gets some air at Pflanzgarten. The car lifts off, corkscrews, and plows into the barrier with its rear end. Bellof escapes without injury, and victory goes to his Porsche-brand rivals Jochen Mass and Jacky Ickx. In 1993 the 24 Hours Nürburgring makes history twice: first, it’s the last time the DTM drives laps in the preliminary program on the Nordschleife; second, victory has never been such a close call. Driving a 911 Carrera RSR 3.8 for Konrad Motorsport, the winning team—Franz Konrad, Frank Katthöfer, Örnulf Wirdheim, and Antonio de Azevedo—has a mere 53.2-second lead over the competition at the finish line. Porsche exults over the fourfold victory, which coincides with celebrations of the 911’s thirtieth birthday. Not until 2015 will there be an even closer result than that. In 2010 Porsche creates a sensation in racing: more than a century after the world’s first hybrid car—the Lohner-Porsche Semper Vivus developed by Ferdinand Porsche—makes its debut, the company presents the Porsche 911 GT3 R Hybrid. Porsche has the guts to put it to the ultimate test: starting at the 24 Hours race on the Nordschleife. This is a Herculean task, since the car weighs 150 kilos more than a conventional GT3 R. But the sports car’s pioneering race proves historic. For over eight hours, the car—driven by Richard Lietz, Martin Ragginger, Marco Holzer, and Jörg Bergmeister—remains firmly in the lead. And then, after twenty-two hours and fifteen minutes, there’s some dramatic action around Metzgesfeld: a massive engine failure. This is not the fault of the hybrid unit, but a problem with the conventional combustion engine. Not quite one year later, at a VLN race, Lietz and Holzer are on the team that will capture the first victory for a hybrid on the Nordschleife. And today, just over half a decade later, Porsche has taken its hybrid drive system to new heights: victory at Le Mans and winner of the World Endurance Championship. Hybrid drive is now used exclusively, even for Formula One. Truly, a concept that has transformed the world of racing. No one has seen the likes of this, not even at the Nürburgring: The Porsche Carrera World Cup, the largest Porsche race of all time, has a field of one hundred entrants from twenty-five countries—a masterful logistical feat. Tire partner Michelin, for example, supplies 550 slicks and 550 rain tires for the Cup cars. The race is a six-lap affair that culminates in a one–two finish by the Austrian team Lechner Racing. René Rast wins with a meager 1.9-second lead on teammate Norbert Siedler under difficult weather conditions on a wet track. Seventy-four of the one hundred drivers reach the finish line. The Nürburgring: a legendary site of legendary feats, not only from decades past. A new legend is created on the day in late summer 2013 when Porsche writes history there once again. The Porsche 918 Spyder (661.4 kW) becomes the first street-legal car worldwide to post a lap time of less than seven minutes for the Nordschleife. With a time of six minutes and fifty-seven seconds, factory driver Marc Lieb beats the previous record by fourteen seconds. Colleagues Walter Röhrl and Porsche factory driver Timo Kluck also stay below the magic seven-minute mark. In a sports car with a hybrid drive system.